No matter how long you’ve fished, or how many fish you’ve caught, certain fishing memories stand out above all the rest. One of my Top Tens goes back a long way, to the early seventies, and a Chinook salmon that was either extremely hungry, monumentally stupid, suicidal, or some combination of all three. The place was Sekiu, or, more precisely, the western end of The Caves, a mile or so west of Sekiu Point. The sun was about to set on a warm, windless evening in late-July, and we were slow-trolling three lines, each rigged with four- or five-ounce mooching sinkers and plug-cut herring, nothin’ fancy. A friend of mine, just out of the army, was at the starboard corner of the transom, his mom in the middle, and I was at the port corner, while my friend’s dad ran the boat. As we trolled east toward Sekiu, my friend’s rod tip dipped once, straightened, slammed back toward the water, and popped back up again; it was over as quickly as it had begun. Several seconds and a few mild obscenities later, the middle rod lurched downward. This time the hooks seemed to stick, at least long enough for the fish to make a short run and then roll to the surface so that we could identify it as a decent-sized Chinook. And then it, too, was gone. And so, with only my line still in the game, we started re-baiting hooks and wondering aloud whether both strikes might have come from the same fish. My friend was checking the spin on his bait when my rod danced a couple of times, and I snatched it out of the holder, flipped the reel into free-spool and then back into gear. Bam! I came about as close as I’ve ever come to having a rod torn from my hands as an obviously big and strong Chinook turned west and headed toward Neah Bay. Two 50-yard runs and a long series of thrashing head-shakes later, we slid it into the net, a long, lean king that two hours later registered just under 20 pounds on the old scale that hung in front of Olson’s Resort. We also weighed a 16-pounder that came aboard just before we had called it quits for the evening. The most vivid memory of that evening, though, came at the cleaning table, as I opened my fish’s bulging stomach and found two freshly ingested plug-cut herring inside. Yep, those three strikes within about two minutes had all come from the same fish, and the third time was the charm! Jump ahead 40 years to 2011 and I’m in Sekiu again, this time with my wife Roberta, and we’re trolling the rocky shoreline east of Mussolini Rock. Instead of plug-cut herring and mooching sinkers, we’re pulling Coho Killer spoons behind Hot Spot flashers at the end of 60 to 80 feet of downrigger wire. We’d started fishing at first light, but it was nearly 7:30 before our first Chinook, a plump 15-pounder, went into the box. At 9:30 another fin-clipped king came aboard, followed by two long-distance releases, then a third keeper of 18 pounds just before noon. We were still trying for that limit-maker Chinook about 1:30, when my line popped out of the release and it was game-on one more time. This fish, though, proved much stronger than all the rest, and at least 15 minutes after it was hooked we were still trying to get our first good look at it. When it did finally roll to the surface near the boat, we saw an adipose fin that at first appeared to be about the size of a playing card. Shortly thereafter we twisted the hook from its jaw and released a king that weighed somewhere between 30 and 35 pounds. It was a great ending to another memorable Sekiu day. Sekiu (pronounced C-Q, for those who don’t know) has provided lasting memories for thousands of salmon anglers over the past six or seven decades, and will no doubt continue to do so for decades to come. Although the fishery—and the community it supports—has fallen on some hard times over the past 20 years, this is still a wonderful, and relatively easy, place to fish. 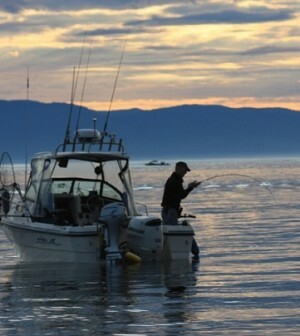 And, when you time it right, Sekiu salmon fishing can be nothing short of lights-out. Sekiu is home to some of the Northwest’s historic and legendary salmon fisheries, from its late-winter blackmouth season known for its double-digit-sized feeder Chinook, to its fall fishery for hooknose Coho approaching 20 pounds. 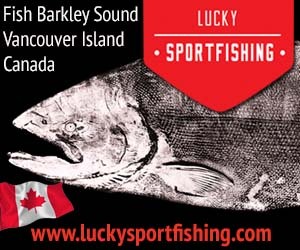 But the ultimate trophies here, as they are throughout most of Salmon Country, are the husky Chinook that pass through the Strait of Juan de Fuca from late-June through early September, fish that generally range in size from the low-teens to the mid-twenties, but sometimes top 30, even 40 pounds. And, speaking of trophies, the state-record Chinook, a fish of just over 70 pounds, was caught from Sekiu-area waters back in 1964. The best-known and most easily accessible spot to catch Sekiu Chinook is “The Caves,” a quarter-mile stretch of steep-sided shoreline immediately west of Sekiu Point, at the western edge of Clallam Bay. 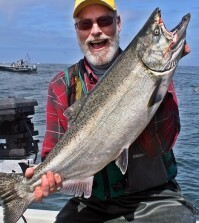 Many a 40-pound summer king has come from The Caves, especially back in the hey-day fishing years of the sixties and early seventies, when three-fish salmon limits were the rule and Chinook under 20 pounds hardly drew a second look from Sekiu-area anglers. Back then, the majority of fish were caught on herring, usually plug-cut and either mooched, motor-mooched or slow-trolled. All three techniques are still effective today, especially during the first two and last two hours of daylight, but relatively few anglers practice them anymore. These days, most anglers in search of summer Chinook fish The Caves with downrigger gear, starting as shallow as 20 to 30 feet first at first light and working deeper as the morning progresses. Troll with the tide or, if there aren’t too many other boats going east-west, fish a north-south pattern to troll cross-current. Most fish flashers and hoochies (plastic squid) or flashers and spoons, and some of the most popular spoons the past year or two have been Coho Killers in silver/chrome, silver/chrome UV, White Lightning, Cop Car, and Cookies n’ Cream finishes and Kingfisher Lites in the same finishes plus Irish Cream. Eleven-inch flashers are standard around here, but the water is usually clear, so you can get by fine with eight-inch flashers, especially if you’re fishing shallow (under 50 or 60 feet) with smaller spoons or squid. The waters west of The Caves also produce decent catches of summertime kings, so it’s worth exploring Eagle Point, Kydaka Point (mouth of the Hoko River) and the Sekiu River mouth, which is the western boundary of Marine Area 5. If you’re on the water at first light you can begin fishing all these spots in water as shallow as 40 to 60 feet, but work your way into deeper water as the sun gets higher. 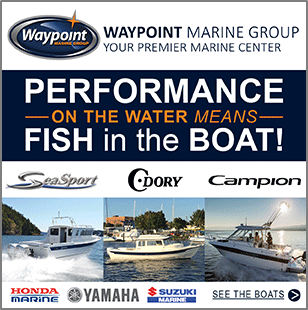 Again, fish with the tide rather than against it, or work tight circles in places where you’re marking a lot of salmon or bait on your depth sounder. 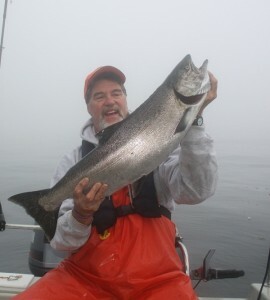 To the east of Clallam Bay, the Slip Point/Mussolini Rock area produces its share of Chinook, and many summertime anglers like to start their fishing day trying for kings near the bottom here for an hour or two before moving away from the beach and fishing higher in the water column for coho. This is another place where motor-mooching or slow-trolling with plug-cut herring near the bottom can pay off, but trolling hardware also catches its share of 10- to 25-pound summer kings. Farther east, although places like Little Mussolini, the Coal Mines, Codfish Bay and Pillar Point are all productive fishing spots in their own right, many anglers—myself included—often treat this entire stretch of water as one long trolling path, working from west-to-east on an incoming tide and east-to-west as the tide goes out. If you find a good concentration of bait, mark a few salmon or hook-up in one location, circle around and make two or three passes through that area before continuing your troll along the beach. 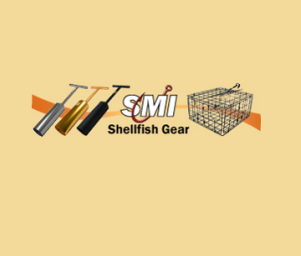 Lines of floating kelp and debris may determine where you fish to some extent, but if possible stay close to the beach—in 70 feet of water or less—the first hour or two of the day, working your way out to 130 feet or so by the middle of the morning. This entire stretch of water is the traditional haunt of motor-moochers, and a few still fish it that way, but trolling downriggers is what most folks do to catch their kings here these days. Flashers with spoons or hoochies are common, but don’t be afraid to fish a whole or plug-cut herring on one line, either by itself or behind a FishFlash, Kone Zone, 11-inch Hot Spot or all by itself. 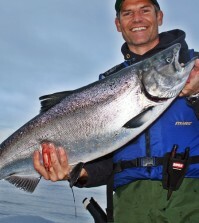 About the time the summer Chinook fishery peaks, usually from late-July through the first week or two in August, increasing numbers of ocean-bright Coho are beginning to invade the Sekiu-Clallam Bay area, and from late-August to late-September the Coho frenzy is in full progress. It’s mostly smaller fish early on, silver streaks of four to six pounds with an occasional seven- or eight-pounder, but by Labor Day the catch is made up of bigger, stronger, crazier fish, and by the time wild (unmarked) Coho become fair game around the middle of September, the fish-cleaning tables in Sekiu become piled high with mature silvers weighing in double digits and sometimes pushing 20 pounds. 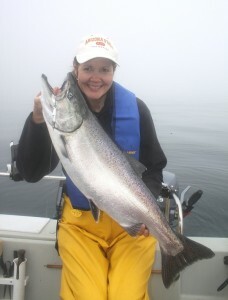 Roberta Rudnick used a silver/chrome Coho Killer to take this 18-pound Chinook near the Coal Mines. You might catch Coho anywhere around Sekiu—we’ve caught them 140 feet down as we searched for Chinook out front of Clallam Bay and just off the bottom while trolling for summer kings in 70 feet of water off The Coal Mines—but when good numbers of ocean-run silvers are passing by, a high percentage of them are caught well offshore, from a mile and a half out in 300 feet of water to the edge of the mid-strait shipping channels where the water may be 600 feet deep or more. Wherever you fish, always be on the lookout for tide rips and current breaks, which hold krill and baitfish, which in turn attract Coho. Also be on the lookout for feeding birds, a strong indicator that salmon are beneath, pushing bait up to the surface. As they are in most places, Sekiu-area Coho are usually found within 20 feet of the surface early and late in the day, and perhaps all day, especially if the skies are overcast. While downriggers may be helpful in trolling at a precise depth should the situation call for it, they aren’t a necessity when fishing for Coho in the Strait of Juan de Fuca. Anglers catch hundreds of them every season on herring baits fished behind two- to five-ounce mooching sinkers, and sometimes you don’t even need the sinker. Whenever we’re fishing Coho with more than two rods, we start the day with an un-weighted plug-cut herring fished in the prop-wash a few feet behind the boat, and it’s sometimes amazing how many strikes that no-sinker rig draws from top-feeding silvers. Although few anglers practice it anymore, the late-season Coho technique of “buck-tailing” involves trolling an un-weighted fly across the surface fast enough to keep it skipping along the top of the water. Diver-and-bait rigs are also popular here, among both Coho anglers and some Chinook fishermen, especially those whose boats aren’t equipped with downriggers. We often fish a Double Deep-Six diver with a whole or plug-cut herring straight back off the transom when deep-trolling for Chinook, or one of the many other divers that don’t dig quite so deep while trolling for Coho. Another effective strategy, especially if several anglers are fishing from the same boat, is to troll bait behind Dipsy Divers, which can be set to run at different angles, greatly reducing the number of tangled lines during a day of fishing. 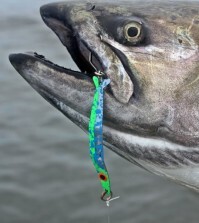 While bait accounts for a high percentage of Sekiu-Clallam Bay Coho, they’ll also grab wobbling spoons, plastic squid and other artificials, especially if trolled behind flashers and other attractors. We’ve taken plenty of silvers here on Coho Killers, Coyotes, Kingfisher Lites, the good ol’ Canadian Wonders and other spoons, as well as hoochies with a bait strip and a variety of small wobbling plugs. If I had to pick only two rigs for Sekiu Coho, though, I’d likely go with a plug-cut herring fished three to four feet behind a large chartreuse or silver plaid Fish Flash, and a Brad’s Super Bait Mini (3-inch) Cut Plug with a slice of herring fillet inside, trolled behind an eight-inch, green/chrome Hot Spot or Pro-Troll flasher or green plaid Fish Flash. Those combinations have put a lot of silvers in our fish box the past couple of years. Whatever you troll, keep it moving right along; Coho have no problem catching up to a bait or lure traveling at three to four miles per hour. If a fast troll isn’t working, try varying your speed every 10 to 15 seconds, so that your offering charges ahead, falls back, rises and sinks through the water column. Another tactic is to run a zig-zag or figure-8 trolling power, which causes a line on the outside of a turn to speed up while the line on the other side of the boat slows. All of these herky-jerky movements of a bait or lure seem to draw Coho strikes. During odd-numbered years, of course, millions of pink salmon come flooding through the Strait on their way toward the Fraser River, Puget Sound and other points east, and Sekiu anglers are there to intercept them. “Humpy-mania” reigns supreme here during a pink-salmon summer, and quick (four-fish) limits are the rule, not the exception. Pinks are often found out in the same open water where you’ll find Coho, but often in a much wider range of depths. Although most are caught within 30 feet of the surface, we’ve caught pink salmon right on top, down as deep as 160 feet, and at virtually all depths in-between. The standard saltwater humpy rig, a small chrome or white dodger two to three feet ahead of a small, pink plastic squid, works as well at Sekiu as it works anywhere else, but a small (red or orange label) plug-cut herring behind a four-ounce mooching sinker also works just fine. And, if you use cut bait, save the heads rather than throwing them in the water; one of my fishing buddies catches almost as many pinks on herring heads as he catches on the plug-cut herring bodies (along with a surprisingly large number of Coho). Pinks tend to like a slower-moving bait or lure than Coho like, so slow to about 1.5 miles an hour to catch them consistently. Also, where you find one of these schooling fish, you’ll usually find a lot more, so if you’ve gone a while between strikes and suddenly hit a fish or two, circle around and keep fishing the same spot for a while before moving on. 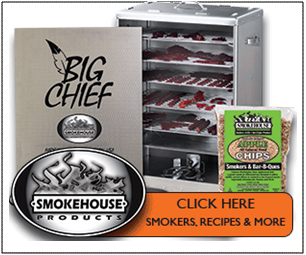 Remember, too, that the flesh of pink salmon is much more delicate than that of other Pacific salmon species, and will turn soft and mushy very quickly if not put on ice immediately and kept cold all the way to the oven, barbecue, smoker or freezer. Fishing Sekiu during late summer and fall sometimes means fishing in the fog, especially during the first half of the day. GPS, of course, will allow you to find your way around in the thick stuff, but won’t warn you about other boats in the area, including the really big ones out in the shipping channels that could chew you up and spit you out without even knowing they hit you. Pay attention to your compass and GPS at all times, stay alert, and listen for sounds that could mean trouble. 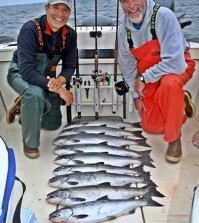 Summer and early fall aren’t the only times to catch Sekiu salmon. This section of the Strait has a long history of productive blackmouth fishing during late-winter and early spring, and the salmon opener was bumped up to December 1 for the 2012-13 season. The Caves, Eagle Rock, Slip Point, Mussolini Rock, the Coal Mines and Pillar Point all are good blackmouth spots. Winter is a great time to mooch or motor-mooch bait or fish metal jigs in all these places, but the majority of anglers these days troll flasher-and-hoochie or flasher-and-spoon rigs. Although the July and August crowds have been surprisingly small at Sekiu the past couple of years, it’s still a good idea to call ahead for motel, cabin, RV and moorage space. And it’s very important to do so when things get busy for the September Coho flurry. The accommodation options include Olson’s Resort (360/963-2281), Curley’s Resort (360/963-2281), Straitside Resort (360/963-2100), Van Riper’s Resort (360/963-2334) and Angler’s Hideaway (360/963-2750). Olson’s and Van Riper’s have boat ramps. Many of the cabins and motel units have kitchenettes, but if you get tired of cooking, try By the Bay Café (360/963-2998), just west of Curley’s. The food’s good, the portions are large, and they’re open from 7 a.m. to 10 p.m.